I see discussion on other aviation forums about a supposed HCAP 'award' to her, but can find no reference to this on the HCAP site. Initially she was listed as here as a recipient of the 'Master's Award' but on the latest web page for HCAP it appears to be 'absent' - has there been a change of mind? What does pop up out of the woodwork is an apparent 'close' (close in terms of the Royal family) relationship with HRH Prince Michael of Kent - who is a liveryman of HCAP. I see also that the ABC news article has 'partially' corrected the 'misunderstanding' on the nature of her flight but still hasn't got it! "Editor’s note (June 1, 2016): An earlier version of this story suggested this was a solo flight. It has now been updated to clarify Ms Curtis-Taylor was the only pilot to fly the vintage bi-plane(??? ), but she had a support team of engineers travelling with her in a separate aircraft, as well as a camera crew, who would sometimes sit in with her." Have any of Ewald's 'pictures' yet surfaced? I have been described as colourful before but more usually infamous. More often than not by the police. No, I don't know this Unwin chappie either. Do we actually think that the girl had a single paper chart on board? Or stop watch God forbid. She would not need either with Uncle Ewald in the front. Good old Uncle Ewald, maybe he had a chart tattooed onto his bum Did they pass over the Horn of Africa? Could have been a navigational misrepresentation of what she was using as guidance. One guy who really did do the kind of flying that Ms Curtis-Taylor purports to have done was the mad, bad and dangerous to know Maurice Kirk. Somebody should write his biography. Perhaps I should? I don't scare easily, although having met him at full chat once at a maintenance shop at Cardiff airport back in the day was enough to unsettle even my tenacious soul. As for charts tattooed onto arses, I am sure that Ms Curtis-Taylor has a far more interesting derriere than old Ewald! M Kirk flew his Piper Cub to Japan without once resorting to the charts supplied to him by the race organisers (nor did he have a GPS)... The charts were discovered unopened lying in a heap in the back when he arrived in Australia. So MA, maybe the girl was flying by the seat of her pants. Oh, and crashing. I popped into have a look at PPRuNe (er I mean TOP) for the first time in a long while tonight and noticed an outraged clamour in the TCT thread. It couldn't have been louder if I had decided to drop my trousers at one of the Queen's Garden Parties. It appears that the old duffers at the Honorary Company of Air Pilots have given or are to give her some sort of award for flying solo with Ewald (as noted by Boac). Actually they now claim it is for encouraging interest in science or some other sundry piffle. Highly amusing! What chutzpah this lady has and how amazing she looks next to all those senior naval types who seem to have bought into the bull as well. Some of the TOP outraged are comparing her to Donald Crowhurst! I sincerely hope the dear lady doesn't follow in that poor man's footsteps. TCT, the story that keeps on giving. Interesting Ian. Perhaps the Honorary Company may have second thoughts The gal is a blaggardess and should have her wings clipped. Tracey Curtis-Taylor, who made headlines claiming to fly her vintage Boeing Stearman biplane ‘Spirit of Artemis’ solo on extended journeys, allegedly did not actually fly solo much of the time. After the revelation by her flight instructor Ewald Gritsch that he occupied the front cockpit of the restored Stearman for all but four of the 36 legs of her flight from Cape Town, SA to Britain, the Light Aircraft Association (LAA) is considering stripping Curtis-Taylor of its prestigious Bill Woodhams Trophy, which it awarded to her in 2015. She was also awarded a Master's Medal by the Honourable Company of Air Pilots in 2016, but that award is now also being questioned. Gritsch was seen escaping the wreckage of Curtis-Taylor's plane after it went down earlier this year in Arizona on an around-the-world attempt, which blew up on the Internet. The LAA said it would respect the vote of its members in the matter. I suspect that the LAA might just pull her award. As for the Honourable Company I suspect there is a great deal of embarrassment amongst some of the members but she has quite a bit of top cover, given her social skills and her connections and the old boys network being what it is and the inability of the powers that be to accept that they may have egg on their faces. All in all a very English/British establishment scandal! I suspect they will kick this into the long grass, although I may be proved wrong, and that she will keep her medal! In some ways she deserves it for brass face alone! Personally I don't think that the lady intended for things to get out hand to the degree that they have in the sense that a good idea and an initial blurring of the truth lead to an unwanted outcome. There's a moral somewhere here and I am apt to think, let's be frank, how many of these television filmed epics and heroes and heroines are actually quite what they appear to be (vide. Bear Grylls and hotels etc)? Due to recent articles in the tabloid press and some internet forums, dealing with reference to my name and role in various expeditions, I have to correct the wrong and at times defaming information published. These articles and internet comments are all based on the misleading and wrong information of a single person. Yes, the Spirit of Artemis is an original Boeing Stearman B75 built in 1942, powered by an upgraded version of the original engine, a 300HP Lycoming built the same year. The airplane had been fully restored in 2012/13 by my company, 3G Classic Aviation in Austria. Like the airplanes of the early pioneers of aviation, the Spirit of Artemis is equipped with additional fuel tanks for long range flights over water, desert, jungles, etc. But as it does not have the range to cross the Pacific or Atlantic it was shipped across these two oceans, just like it was done by many aviation pioneers on their expeditions in the 1920s and 30s. .Yes, this Boeing Stearman airplane is owned by Tracey Curtis-Taylor, who commissioned the restoration in 2012. .Yes, the Spirit of Artemis is a basic stick and rudder airplane, like in the old days of aviation, no autopilots, artificial horizon or modern IFR equipment installed. The only up-to-date addition is a radio, transponder and GPS, which is a legal requirement for flying into controlled airspaces, like around international airports and other restricted airspaces. Naturally this had not been a requirement in the early 1900s. .Yes, all the expedition flights were performed by basic VFR navigation, following rivers, roads, railroads, coastlines, etc, at low level. Although the GPS served as a backup these flights were not performed IFR or on instruments. .Yes, Tracey Curtis Taylor was the sole pilot on all her expedition flights. She has more than enough flight-experience as well as piloting and navigational skills to perform all of these flights on her own. It was never planned to copy the historic flights in every detail or to break any historic records, but to celebrate the achievements of the pioneers of aviation by retracing their routes in a beautiful biplane from this era (where politically possible). Tracey Curtis-Taylor has earned the acknowledgement and awards given to her. Flying such a basic, historic airplane VFR all across five continents (not IFR on instruments and autopilot), is a fascinating adventure and achievement many would dream about. In contrast to the ones criticising her she just did it. .My role during the expedition from Cape Town to England was initially the reassembly of the airplane in Cape Town and the technical support during the expedition. Additionally I had to take over the flight planning across Africa at short notice, which was done together with the professional African pilots in our team and two major aviation companies. On the following expeditions I took over the tasks of supporting Tracey Curtis-Taylor with all the flight planning and logistics. Besides I am taking care of the technical needs of this airplane, the chase plane, supporting the ground handling, filming and ordering the drinks for the crews in the evenings. Yes, like others I had the opportunity to enjoy a very special view on planet earth from the front seat of this open cockpit biplane. But I did NOT act as a pilot nor as a flight instructor on these expedition flights. .Yes, the flight-planning & logistics of our expedition across Africa in 2013 was problematic. This expensive and at best disappointing experience was the reason to do all the flight planning and logistics for the following expeditions by ourselves. The simple fact is: Based on her fascination with historic aviation Tracey Curtis-Taylor was organising all these expeditions and was flying a beautiful old biplane across five continents. 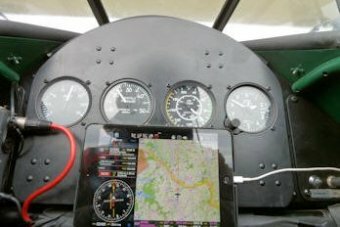 Basic hands on flying and basic VFR navigation. Nothing more and nothing less. In contrast to this it was very motivating to experience the great support of the worldwide aviation community, with all their help and positive emotions when another pilot is simply living the old dream of flying (and sharing this dream with others). Should I send Mr Gritsch an e-mail politely questioning the photos of him in the second seat at times we were led to believe Ms Curtis-Taylor was actually flying solo? He seems to miss the point that while we all admire the effort and dedication she put into the operation, it cannot be considered to be a solo flight, and that the 'negative headlines' were generated by T C-T herself. I'll say one thing for Mr Ewald and his team is that they know how to put an aircraft back together. When I saw Spirit of Artemis at Farnborough this year she was in concourse condition after her tangle midst the tumble weeds. Why not MA. Probably wouldn't get reply. "......many would dream about. In contrast to the ones criticising her she just did it" That is because she has dosh. I will stop criticising an 'do it' if she pays. Love the bit about the GPS as a 'backup'. I too have huge admiration for what Ewald does in avaition but think he has hung his flying helmet on the wrong peg here. Not sure if you read this stuff or not - notwithstanding everything else that has been said, when you next speak to Curtis-Taylor, would you mind awfully if you ask her to stop wearing the RAF Pilots Flying Badge on any garment she deems necessary to flaunt them upon. As far as I know (as she keeps telling everyone), for one reason or another she didn't make it into the Royal Air Force and has absolutely no right to wear the wings that I worked bloody hard to achieve and then subsequently operate under while being shot at etc. I remember seeing some RAF orientated calendar many years back with a very good looking wench in a RAF outfit (or, to be more precise, almost in a RAF outfit) posing next to a Hawk and she was sprouting wings as well and I don't remember any hoo-hah about that. Maybe she was a member of that esteemed air force, but somehow I doubt it! Bloody hell. I hope this isn't true. I would be interested to see a photo if it is. That would be the icing on the cake to strip her.......er of.......er.......all awards I was going to say. I say! If those 'wings are indeed RAF wings I vote she be used as a ball in the next game of Mess Rugby. PS Who might that be being a bit photo-shy in the front seat? Got my No.5s here, I know, but came with everything from the UK and never know when The President may invite me for din dins. My gold wings from 1979 do not look quite like those, the tips curve upwards not down. Can't post photo on 3G.